Nungalinya College is a combined churches theological college that has been training Indigenous Christian leaders in the Northern Territory and Australia for over 40 years. CMS has been partnering with Nungalinya College since it first opened in 1974, and this partnership continues to be vital for the sustainability of the College. CMS missionaries Mandy Jones and Liz McCoy teach at the College and Terry McCoy is the Anglican Dean. Most of the current Aboriginal ordained ministers in the NT churches studied at Nungalinya, and many lay leaders as well. Nungalinya is unique. 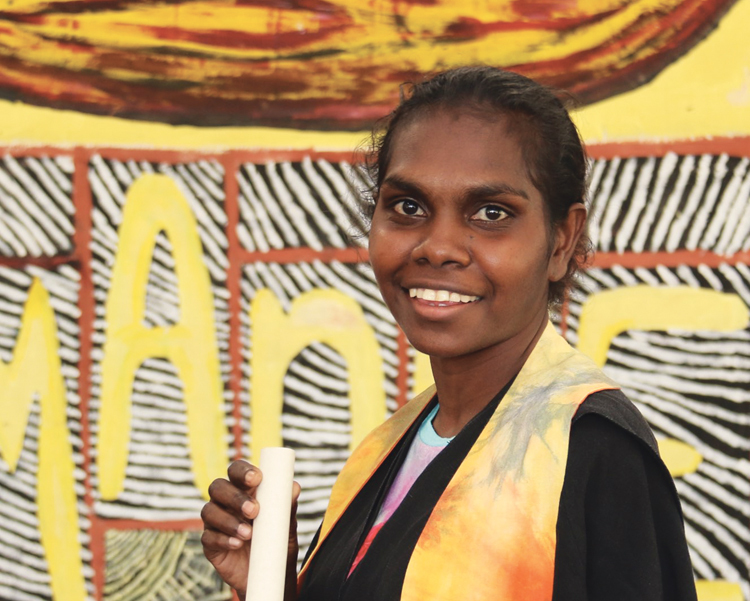 In response to falling levels of literacy among Aboriginal people, most students begin their studies at Nungalinya with the Certificate I ‘Foundations’ course. Students learn basic numeracy and literacy skills, using the Bible as the main text. This course provides vital building blocks for further studies. Many of our students are already leaders in their own communities, but our role is to enhance their knowledge of the Bible, teach skills in leadership, promote thinking about the challenges of gospel and culture, and give opportunities for periods of sustained study and reflection away from the challenges of community (intensives). As we teach at Nungalinya, we actively encourage students to think about the meanings of different concepts or words in the Bible in their own languages, traditions or communities – even if they don’t have scriptures in their language. We give students opportunities to discuss topics in small groups in their own languages. The Assistant Teachers are essential to the future of Nungalinya College and also the Aboriginal Church. We would love to see more Indigenous Christians receiving training as teachers. Our students make the College what it is – they want to learn the Bible and grow in their faith despite facing huge challenges. For example, a young woman came to study at the College because she wanted to grow in her faith. She travelled twelve hours by minibus from her community with her two-year-old son to study and live on campus for four weeks. While she is studying, her partner, who has physically abused her in the past, keeps calling her and threatening her so she has to turn off her phone. She tries really hard to study, but she is distracted by the problems in her personal life and also struggles to leave her son at the crèche. Stories like hers are repeated over and over among our students. As we look to the future of supporting the Aboriginal Church in North Australia through Nungalinya College, there are so many possibilities. As CMS is looking to place more workers at Nungalinya College – there opportunities for people to serve in a variety of ways, including as teachers, admin staff, a librarian and volunteer weekend hosts. We also want to extend the opportunities for further theological study, including adding a Diploma course, and we would love to develop and improve our College facilities to allow for more students. In addition, we would like to be able to offer a course that equips people to deal with some of the chronic issues in communities including addictions and mental illness. Please pray that Nungalinya College staff would be Christ-centered in all things, and that God would provide for all the needs of the College. For more prayer points and information about Nungalinya go to www.nungalinya.edu.au/get-involved/prayer/. Be inspired by God’s powerful work in the lives of Nungalinya students. Watch Justine’s story here and Joel’s story here. Both students have continued to do further theology studies!